"Perhaps a little late in the snowbird season, a new flock of travelers made their mark at 2RR, an uninteresting single runway airport adjacent to perhaps one of the most interesting attractions central Florida has to offer (sorry Orlando). River Ranch is what some might call a "dude ranch," a place where one might go to experience a little of old Florida. A shooting range, swamp buggy rides, and even a full blown country rodeo. And perhaps this most recent weekend, there was also a seemingly endless stream of airplanes flying low overhead the campground located just beneath the approach end of 34." 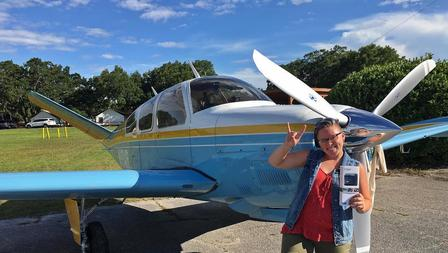 Photo of Patty Fritz after winning the Millennial Wings first spot landing contest. Patty took home a new GoPro Hero Plus Provided by the Banyan Pilot Shop! "For the kids, and that's all we are, of the Millennial Wings, River Ranch is also proof to even the most pessimistic pilot that perhaps there is life in General Aviation beyond the baby-boomer pilots we're all children of in the first place. We are proof that flying will live on, and it is up to us to maintain a legacy that has kept young boys and girls looking up everywhere since 1903."